this polyester souvenir shopping bag. What is your typical dream of discovering Paris? Perhaps it’s a romantic stroll sauntering by the second hand booksellers along the Seine to the Tuileries Gardens and getting lost on the way via the winding side streets; perhaps it’s a fly-boat (fr. : bateau-mouche) trip sipping bubbles past Notre Dame or a bird’s-eye city view from the Eiffel Tower, L’Arc de Triomphe or La Défense; perhaps it’s an artsy pilgrimage to Le Louvre, Musée d’Orsay, or an impressionistic stop at L’Orangerie or Musée Marmottan? Beyond the customary tourist spots, could it be a glitzy glimpse at the high-end jewellers of Place Vendôme, a star-studded walk along rue Faubourg St-Honoré’s designer fashion boutiques and perfumeries? Or perhaps a whirlwind shopping spree at Les Grands Magasins, finishing off with a coffee on the top floor to check if there is a fantôme running across the Opéra’s roof? It could be all of these things. But let me tell you that there’s a significant new accessory that reveals where visitors are now heading in the City of Light. Many are now clutching familiar looking pastel green pâtisserie bags as if they were hand-made designs from Hermès or Vuitton. No trip to Paris is complete without stopping off at one of the fashionable pastry shops – either between visits or an actual detour to taste an artisan's signature delicacies. When it comes to pastries, the French are serious! They don’t just create them to perfection – they know how to present and sell them, magnificently. 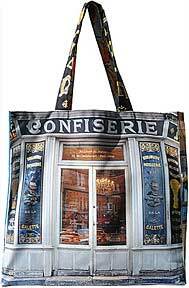 Who can resist the temptation of a French pastry when you see the Masters’ works of art in the window fronts? They just have that savoir faire how to present things. They can make a doughnut look glamorous, for goodness' sake. Except they'd call it a beignet. Parisian bakeries (which also sell croissants under the umbrella of viennoiseries, breakfast breads) don’t always sell pastries, and vice-versa. This may sound crazy, but it’s one of the first things I learned on arriving here as a student 20 years ago. Ask for a baguette in a pastries-only shop and you could get shot one of those looks – as if you’d crawled out of an éclair au chocolat. Many pastry shops these days are designed as luxury boutiques. Take a look at Ladurée on the Champs-Elysées, complete with a glitzy pastry bar that easily rivals the buzzing social-scene bar of the Plaza Athénée. It’s not just about buying a decadent pastry: it’s about queuing in the excitement, deliberating your choice from the chefs’ delicious works of pastry art, and settling down in style with a pot of speciality tea or coffee to perfectly match what sticks to your silver pastry fork and spoon. Most visitors to Paris head to Ladurée’s Champs-Elysées or rue Royale salons – but don’t forget that there are many other hidden gems on the scene. I love to hide out at Jean-Paul Hévin’s Chocolate Bar and savour his chocolate-raspberry pastry or have a hot chocolate that rivals that of his legendary neighbour at Angelina Tearoom. If you are a real chocoholic, then a jaunt to Jacques Genin's salon de thé is worth a detour to the 3rd arrondissement for a decadent dégustation; sit on a leather sofa amongst the fresh floral arrangements, and admire his chocolate sculptures while sipping another famous spoon-clinging hot chocolate. The other jewels in the pastry crown are boutiques where you don’t sit down, but savour their masterpieces under the shade of a cherry tree by the Seine. Hugo & Victor, Pain de Sucre, Pâtisserie des Rêves (literally translated: pastry shop of dreams), for example, have boutiques which are reminiscent of a museum. The latter’s signature pastries are magnificently showcased in upturned glass bell cases hung with counter-weights. When visiting les Grands Magasins, such as Printemps or Galéries Lafayette, one begins to realise that there’s a particular kind of pâtisserie which rules in Paris: Le Macaron. 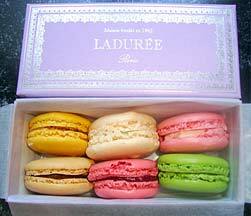 They have macaron boutiques within their stores showcasing a wide array of macaron flavours from the macaron master himself, Pierre Hermé, plus those of Ladurée and Le Café Pouchkine. 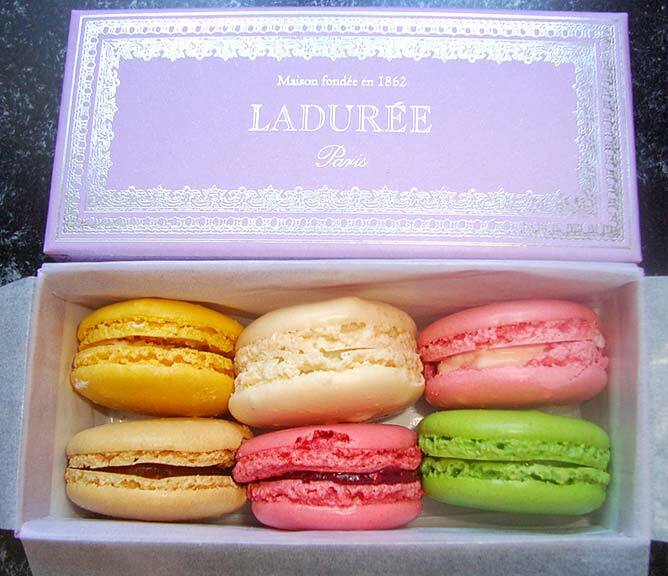 There’s something so particularly visually appealing about Parisian macarons: they come in such pretty pastel shades or vibrant look-at-me rainbow colours as they adorn stunning displays. There’s the macaron tower of Stohrer (reputed to be the oldest pastry shop in Paris) plus many other creative designs using macarons: adorning handbags, hot-air balloons and pyramids. Even a day trip to the Château de Versailles features the macaron with Ladurée in the castle grounds, tempting visitors in the footsteps of Marie-Antoinette with un petit macaron or two. The vast dining hall at the Château de Vaux-le-Vicomte is decked out with an enormous macaron tower and – on leaving via the boutique – the tower scene is recreated on brightly coloured aprons. Plus, just in case you missed them, there’s a chance for you to satisfy your last macaron urge at Charles de Gaulle airport. Just be careful if you carry them home in these little pastel pâtisserie boxes.